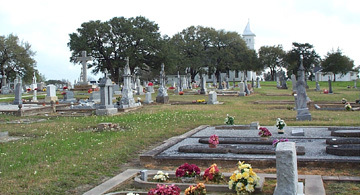 Taken from St. John the Baptist Catholic Cemetery, St. John's, Texas, ©1998, with the permission of the author, Norman C. Krischke. St. John the Baptist Catholic Cemetery was established February 29, 1988 upon purchase of land from Neill M. and Anthoria (Clayton) McKinnon. The original piece of land for the Church and School was purchased from Johann Klesel for $5.00 on October 2, 1882. A beautiful two-story school was the first building erected on the land; the church was not built until 1888. Before that, the Czech people of the community went to Praha to attend mass while the Germans went to High Hill. Occasionally a priest would journey to St. John's to say mass in the home of Johann Klesel. There are 659 grave markers in the cmetery [in 1998]; those in the west half face east; thos in the east half face west. The majority of the graves are marked with a variety of beautiful tombstones, some with marble angels. The cemetery cross was donated in 1944 by Mr. and Mrs. Joe G. Havrda in memory of their son, Joe C. Havrda. There are fifty-seven unknown graves. Mr. Krischke's booklet contains information on the history of the cemetery, tombstone inscriptions, church's record of some interments, grave locations from cemetery map, and obituaries. It can be found in the Fayette Heritage Museum and Archives. See the Victoria Diocese searchable cemetery database which includes the St. John Catholic Cemetery. Information on unmarked graves was taken from the church's Record of Interments or Cemetery Map by Norman Krischke. Information on burials after 1998 comes from obituaries. BARTOSH, ALOUISIA A, 7 JUN 1886, 2 JAN 1973, Wife of John E Bartosh. BERGER, ANNIE, 13 FEB 1880, 11 JAN 1960, Wife of Fred A Berger. BERGER, HERMINA, 28 JAN 1837 , 11 AUG 1969, Wife of Emil L Berger. BESETZNY, MARIE, 8 AUG 1876, 3 JUN 1943, Wife of Charles J Besetzny. CERVENKA, ANTONIN A., 8 JAN 1845, 10 MAY 1902, Born in Tiche Morave. Husband of Josefa Cervenka. Died in Moravia, Lavaca County. EHLER, ANNA, 30 APR 1868, 13 JUN 1955, Nee Walzel wife of Frank Ehler. HAAS, CAROLINA, 3 MAR 1862, 18 SEP 1945, Wife of Ferdinand Haas Nee Berger married 11 January 1885 Daughter of Anton Berger. JANISCHKA, ALOISIA, 1879, May 1905, Wife of Emil Janischka Nee Bartosh. KRUPALA, BRIDGET E, 31 JAN 1917, no death date, Wife of Julius J Krupala. SPANIEL , JULIUS, 27 DEC 1907, 21 JAN 1965, Son of Ludvik & Aneska Spaniel. SPANIEL , LOUIS, 4 APR 1893, 14 JUN 1971, Son of Ludvik & Aneska Spaniel. STERNADEL, OTTILIA, 15 SEP 1887, 22 MAY 1969, Wife of Frank Sternadel. VANA, MARY, 9 MAY 1893, 22 JUL 1972, Wife of Willie Vana Sr. Many thanks to Vicky Busby for transcribing the data from Norman Krischke's book for this site. Please contact Rox Ann Johnson with additions or corrections.